The all new Chip-DSC 10 integrates all essential parts of DSC: furnace, sensor and electronics in a miniaturized housing. The chip-arrangement comprises the heater and temperature sensor in a chemically inert ceramic arrangement with metallic heater and temperature sensor. This arrangement allows superior reproducibility and due to the low mass outstanding temperature control and heating rates of up to 300°C/min. The integrated sensor is easily user exchangeable and available for a low cost. The integrated design of the chip-sensor delivers superior raw data, which enables a direct analysis without pre- or post-processing of heat flow data. The compact construction, leads to a significant reduction in production cost which can be passed on to our customers. The low energy consumption and unrivaled dynamic response result in unsurpassed performance of this revolutionary DSC-concept. Worlds only commercial Heat Flux DSC with integrated heater and temperature sensor. Unmatched sensitivity, time constant and heating / cooling rates. The innovative low mass Chip DSC sensor design enables us to offer a Heat Flux DSC Sensor with unmatched response rate. The unique sensor design permits benchmark resolution and perfect separation of overlapping effects. 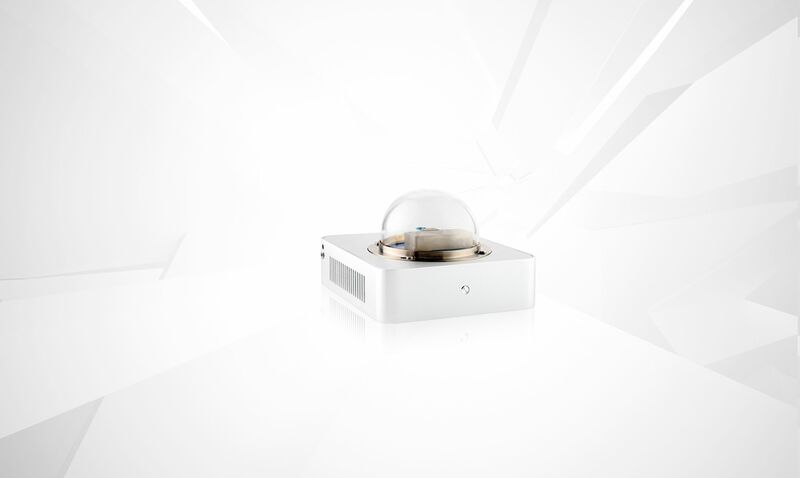 Due to the low mass of our Sensor we can achieve unmatched cooling speeds, enabling exiting new applications and a higher sample throughput. 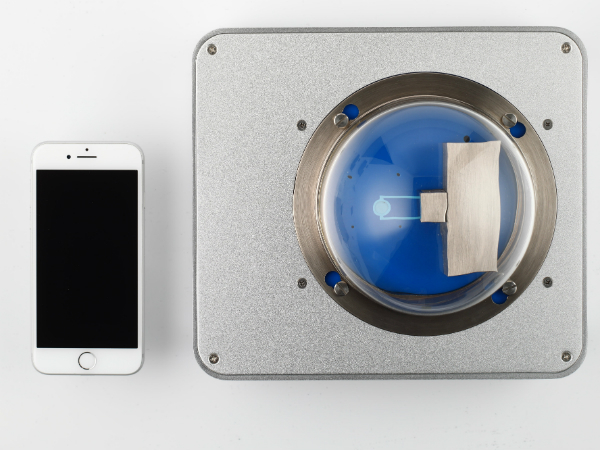 The Quench cooling accessories provide and open cooling container surrounding sensor an sample. Coolant dependent, i.e. dry ice or LN2, sample temperature can go down to -180 °C. This systems does not allow defined gas atmospheres while measuring, as outgasing will surround the sample. The all new Platinum Software greatly enhances your workflow as the intuitive data handling only requires minimum parameter input. 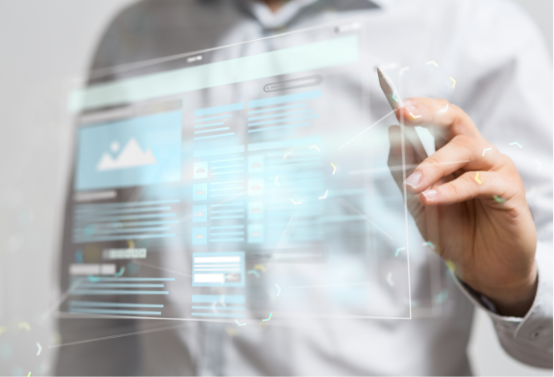 AutoEval offers a valuable guidance for the user when evaluating standard processes such as glass transitions or melting points. 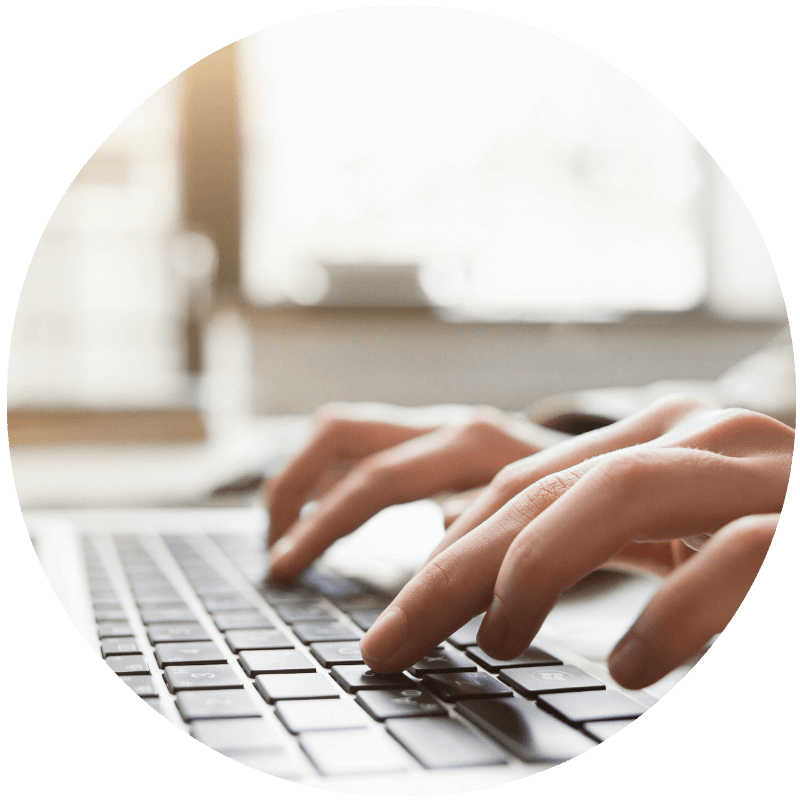 Thermal library product identification tool, provides a database with 600 polymers permitting an automatic identification tool for your tested polymer. Instrument control and/or surveillance through mobile devices gives you control wherever you are. The LINSEIS Chip-DSC allows fastest possible ballistic cooling rates without any active cooler needed. Due to the low thermal mass and innovative sensor design, cooling rates up to 500 K/min from 400°C on can be reached. 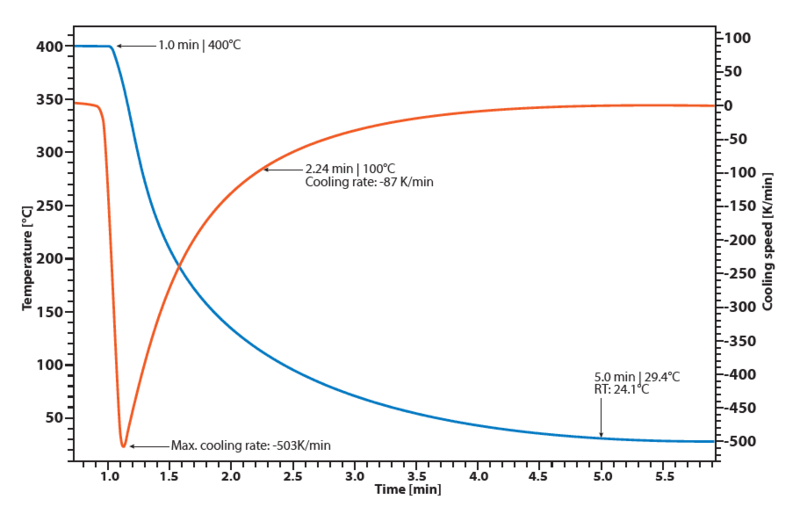 Even cooling to 100°C can be done with cooling rates of up to 90 K/min. A cooling from 400°C down to 30°C can be done in 4 minutes just by ballistic colling without need of any additional cooling devices. Of course, the signal can still be evaluated during that cooling segment and does not lose sensitivity or accuracy. The analysis of polymers is one of the main applications of DSC. Effects like glass transitions, melting and crystallization points are of interest and often very hard to detect. 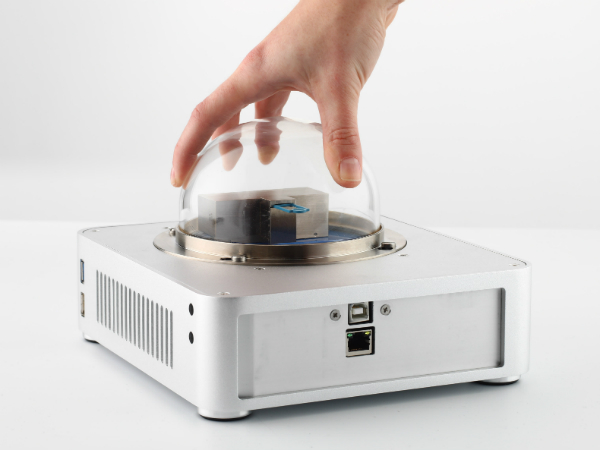 The new LINSEIS Chip-DSC provides high resolution and sensitivity, making it an ideal instrument for this kind of analysis. 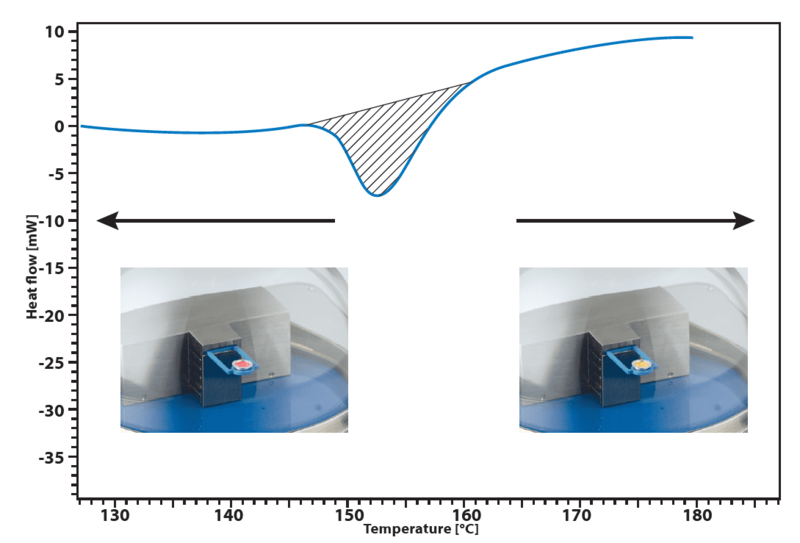 As an example, a PET granulate was heated, quench cooled to freeze the amorphous state and afterwards analyzed by Chip-DSC with a linear heating rate of 50 K/min. 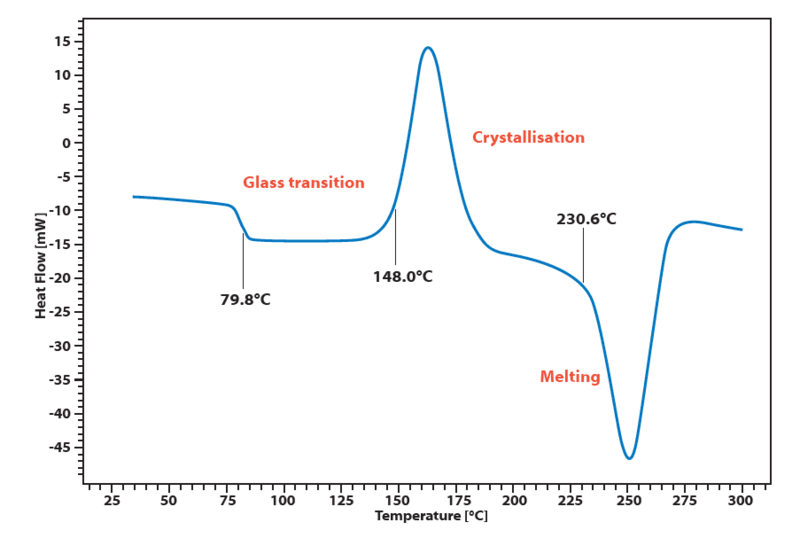 The curve shows a significant glass transition around 80°C, followed by a cold crystallization of the amorphous parts starting around 148°C and a melting peak at 230°C. Highly energetic materials are used in airbags, as propellants, blasting materials etc. For any type of DSC instrument, there is a risk of damaging the sensor and even the furnace. In the Chip-DSC, the chip (integrating sensor and furnace) can be easily replaced by the operator at low cost and in a short time. In case of a damage to the instrument, the downtime of the instrument is reduced drastically. Change oft he sensor needs only some seconds and the calibration can be done in less than half an hour. The example shows the DSC diagram of 2,8 mg of airbag igniter. 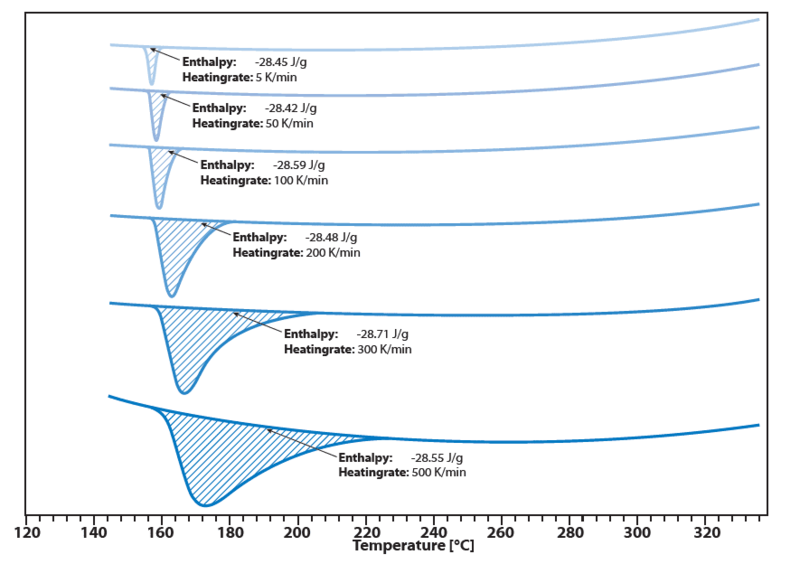 Extremely high heating rates up to 1000K/min can be achieved while the reproducibility of the melting enthalpy remains excellent. The example shows the melting point of Indium measured with different heating rates (5 K/min; 50 K/min; 100K/min; 200K/min; 300 K/min and 500K/min). This means that a complete analysis including heating and cooling can be done in only 10 minutes without any need for optional cooling devices. In classical DSC instruments the sample cannot be observed during the measurement. Observation can give further usefull information (forming of bubbles, fumes, change of color, etc.). 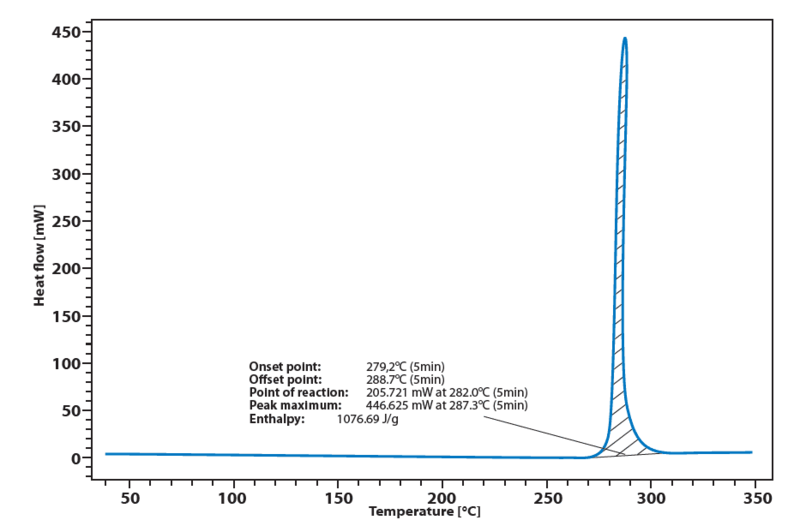 The graphic shows an example of a thermochromic material, showing an endothermic phase transition at 160°C. The phases have different colors and the color change from red to yellow can be seen through the transparent cover. A camera option for recording images is available. 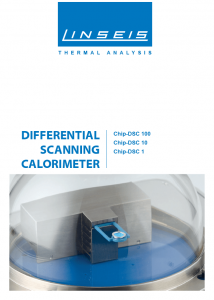 Beside the caloric measurements of phase transitions, the Chip-DSC is also able to determine the specific heat capacity. The Chip-DSC can realize this with only one crucible by using a definite modulated heating rate. 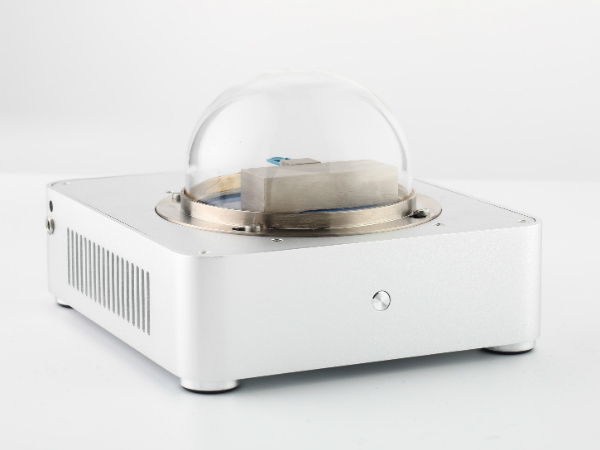 Therefore a calibration measurement with a reference material (like sapphire) is recorded, followed by the measurement of the unknown sample that can be evaluated using this calibration. 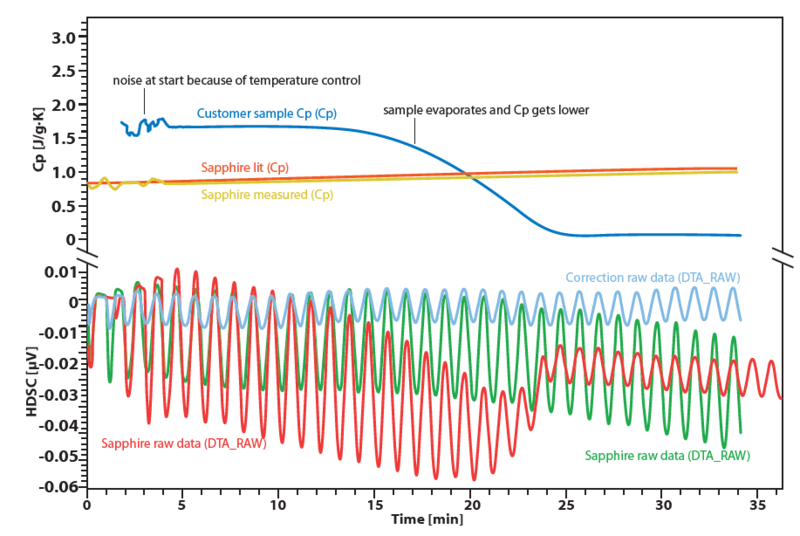 The measurement shows the modulated measurement of heat capacity of sapphire at a heating rate of 10 K/min with amplitude of 3 K. Due to the fast changing temperature and the change of the amplitude caused by the heat capacity of the sample, there can be achieved a good signal quality that allows evaluation of heat capacity with an error of only 3.5 %. This is significantly better than most commercial classic DSC devices.